We have come to know so many special Golden Oldies or Mellow Yellows, as they are sometimes called. The story of Golden Oldie Bullet, the special 15-year-old pictured here who alerted Mom to his new baby brother's distress, was broadcast all over the country. Old dogs used to be a rarity. But, not now! That's due to our increased awareness, better veterinary care, and improved diets. With nearly 40% of our canine buddies considered geriatric, is it any wonder that veterinarians and researchers are now focusing on geriatric nutrition, dental care, and cancer? Tufts University defines the senior dog this way: "The point at which a dog qualifies as 'aged' varies. Veterinarians generally consider small dogs to be senior citizens at about 12 years of age, while large dogs reach the senior stage at 6 to 8 years of age. This roughly corresponds to the 55-plus category in people." Below, is a true Golden miracle that went by the name of Chance. Formally, Synergold Beau Geste Quand'ry JH, CD, WCX, CGC, of Jan Bramhall's Beau Geste Golden Retrievers, Chance enjoyed 19 wonderful years. The photo below, with his pal Rhyme, was taken on his last morning of November 5, 2005. Synergold Beau Geste Quand'ry JH, CD, WCX, CGC "Chance"
Did you know that . . . . your Golden does his/her fastest maturing in his first two years, already equal to a 15-year-old teenager after only one year. And, believe it or not, he or she is equal to an adult's age after only being with us two years. After that, however, only 4 years in maturity is gained with each passing year. 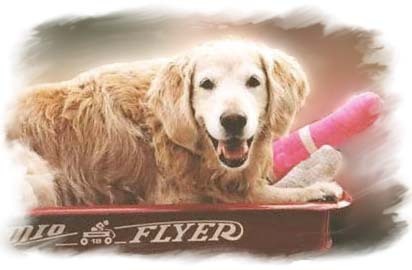 Did you know that at . . . .
7 YEARS: Seven marks the beginning of the geriatric period for medium sized dogs like Goldens—even though your dog may still look, act, and feel great. It is now time for your Golden's first geriatric profile. Start looking for changes in your Golden as they tend to hide their illnesses from you until the problem is so advanced that they can't hide it anymore. So, take your aging buddy to the veterinarian every year. 8-10 YEARS: Now, in the early years of the geriatric period, body coordination can become a common problem. There is also a risk for obesity because their energy requirements drop. So, check for signs and use different methods to decrease food intake. Make sure your veterinarian gets a geriatric profile on your Golden. Have the following tested: kidney function, liver function, blood sugar, hematocrit (ratio of red cells to whole blood), and total protein. 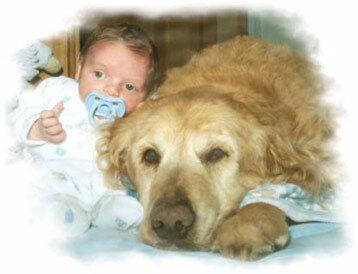 10-11 YEARS: Older geriatric Goldens now begin to show many of the diseases of aging, in no particular order. Much of this, though, depends on the Golden's individual makeup and environment. Watch for signs for declining dental health. This, of course, is preventable by providing good dental care from day one. Also, watch for digestion problems, kidney and liver problems, heart disease, diabetes, and cancer. Nutritional needs change for older dogs, research showing the need for more protein to maintain lean body mass. 12+ YEARS: Now, older Goldens often have more problems keeping weight on, than they do with keeping it off. Losing weight, though, could be a sign of many physical problems. Or it could be due to a simple lack of interest in food that is too hard to chew or no longer appealing because of a declining sense of taste. 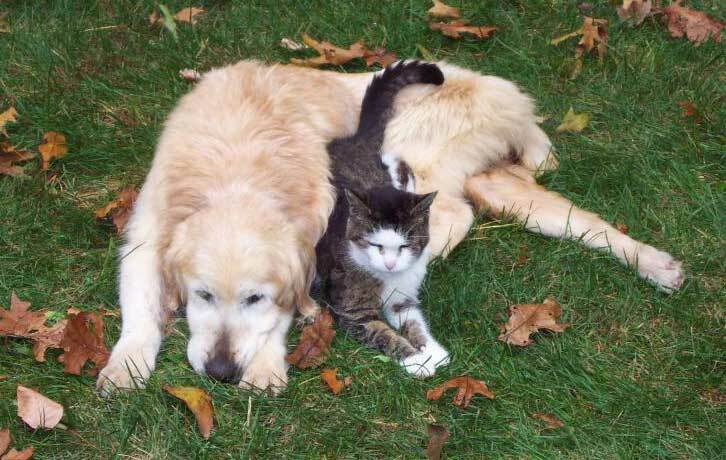 Ease your Golden into old age— the older your good buddy becomes, the more s/he depends on their schedule. If there is a vision or hearing loss, don't rearrange your furniture. Don't change your guy's eating or sleeping habits, and try not to alter his or her daily routine. Any such disruption can be stressful. Also, groom your buddy and periodically examine him or her for abnormal lumps. Your Goldens also need to be touched and cuddled to reassure them that the dog-human bond is still intact. Touch is extremely important in the lives of older canines, especially those who can't hear or see as well. Finally, let your guy know you're still there. Thank him or her for a lifetime of love, loyalty, and companionship. Your Golden has devoted its very life to loving you. The least you can do is keep him or her healthy, fit, and confident in your affection. Making informed choices regarding vaccinations is important. We titer through Cornell University—a high reading indicating adequate antibodies and no need for a booster (which can weaken the immune system). The Rabies Challenge Study may also show the need for less vaccinations. Learn more about vaccinations, when to spay or neuter, heartworm medication usage, thyroid testing, and immune system implications. Dr. Day: Why is this Disease Immune? 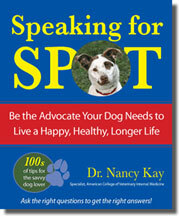 Now, in 2010 this wonderful book by veterinarian, Dr. Nancy Kay, is already in its third printing! It was honored in 2009 by the Dog Writers Association of America and her Speaking for Spot Blog won a Best Blog Award as well. We love how Dr. Kay helps you come to grips with a cancer diagnosis, and explains the tough choices that are bound to follow. Plus, you’ll find an alphabetical listing of the most common symptoms experienced by dogs and the questions your vet is sure to ask when you report them—not to mention hundreds of prevalent diseases and related points you should be certain to clarify before leaving your vet’s office with a treatment plan in hand. A labor of love, this book was fueled by her passion to teach people how to be effective medical advocates for their four-legged best friends. Gone are the days of simply following doc’s orders―today’s dog lovers are confronted with health-care decision-making on many levels. How do I find a vet that feels just right for me and my dog? How will I be able to afford my dog’s health care? Is pet insurance the way to go? Does my dog truly need all those vaccines listed on the reminder postcard? What are the important questions I should be asking my vet? Does my dog really need the surgery or procedure that has been recommended? Are there other options I should be considering? When is it appropriate to get a second opinion? Where should I go to get one and how can I avoid offending my vet? Should I take my dog to see a specialist? Should I consider treating my dog’s cancer? Am I doing the right thing? Am I doing this for him or for me? Is my dog ready to say goodbye? Am I ready to let him go? What are my choices when it comes to the euthanasia process? If you’ve struggled with these questions, you’ve come to just the right place! Dr. Kay and Speaking for Spot will help you answer all of these questions and many more. With warmth, candor, and humor cultivated over 20-plus years of working with dogs and their human companions Dr. Kay provides an insider’s guide to navigating the potentially overwhelming, confusing, and expensive world of veterinary medicine. The result is everything you need to know in one fabulous, fully illustrated book. Speaking for Spot is the consummate guide on how to be your best friend’s medical advocate! Be sure to learn about Going Organic and our pages on Food Glorious Food, as well as to learn The Whole Tooth. Honestly, there is so much to know when it comes to good care for our animal companions. And, that means knowing about key disease and behavioral issues. One great overall publication that will help to keep you current on all things dog is The Whole Dog Journal., a monthly guide to natural dog care and training. This guide advocates natural and holistic feed, healthcare methods and successful nonviolent training . . . and does not accept commercial advertising. We have subscribed to this newsletter for many years now as it is invaluable. We have collected many resources on areas related to disease conditions, aging, and behavioral problems. Be sure to explore the pages and materials below. Living with Life Challenged Dogs — Help dogs overcome obstacles from birth, due to aging, or due to accident. Dealing with Anxiety & Fears — Learn about phobias, counter-conditioning, desensitization, and more. Become Cancer Aware — Learn to be proactive with respect to screening, and prevention. Bentley: ACL injury or not? Belle made it past her 17th birthday. Quite a story for a dog that was abandoned at nearly 9. Around age 9 Belle was hit by a school bus, losing her left front leg. Her owners abandoned her; whereby Kris rescued her and taught her how to walk on three legs. In this video she is recovering from pneumonia and cannot walk. A vet contributed the wagon and a painter contributed the exquisite artwork. At nearly 17 years old, Belle was "eating hamburgers, hot dogs, cornbread with fresh blueberries, spaghetti, and grilled ham and cheese sandwiches". These pictures were taken in 2001 at an AKC dog agility trial in Cato NY. Belle was certified by TDI and Delta and labeled as an "awesome Team". She gave much hope to hospitalized children who had lost limbs. They witnessed Belle hopping carefree through the halls and rooms and realized they were not alone. Please enjoy these wonderful tales of some of our Treasured Golden Oldies. This herbal for both dogs and cats stimulates the enzymes in saliva, so cleaning away plaque buildup. 100% Organic Active 15+ Manuka Healing Honey and treats for health & immune issues. Web exclusive. Vital Choice 100% Wild Alaskan Red Sockeye in pouch for travel. Also, troll-caught Albacore Tuna. Organic Sweet Potato and Hemp Chews and Organic Sweet Potato Chips from Oregon. With Vitamin E.
Barkwheats, Dr. Becker's Bison Bites, Primal Pet Chicken. Our Golden Alfie has gotten 6000 units daily since 2007, before that getting 3000-4000 units a day. Boy, what a difference it has made. His coat is incredible, and at his now senior age of 9 (2008), the extra softgels keep down joint inflammation associated with increasing age and arthritis. It is a must-have supplement! Derived exclusively from wild sockeye salmon caught in the cold, pristine waters off Alaska, this 100% PURE oil is not blended with any inferior salmon or other fish oils. Here's why this is unique: To achieve high ratios of EPA to DHA, commercially available salmon oil capsules are fortified with other fish oils. One benefit of Vital Choice Wild Alaskan Sockeye Salmon Oil is that it has the lowest cholesterol levels, in contrast to the higher levels found in farmed salmon oil. 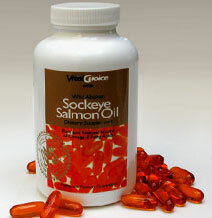 The freshest and purest oils available, Sockeye contains the highest amount of omega-3 fatty acids of any salmon. It's orange color is due to the high levels of the carotenoid and astaxanthin (occurring naturally in sockeye) that helps the eyes and cardiovascular system. Alaskan sockeye salmon are the richest salmon species in the powerful biological antioxidant astaxanthin, a natural caroteniod that imparts a rich orange glow to the oil and eliminates the need for added tocopherols present in other brands. Astaxanthin is a natural carotenoid that gives our oil its rich orange color—and is up to 100 times more potent than Vitamin E at quenching singlet oxygen ‘free radicals’. There are NO artificial preservatives, color or sweeteners; corn, dairy, starch, wheat, or yeast.